Data collection was driven by our understanding of space as a dynamic interface, and of data as a dynamic catalyst. While the physical space itself remains essentially static, the elements of the space are constantly changing through time. These elements include traffic flow, weather, sun, shade, and time of day (to name a few); each of which operates on a dynamic and evolving agenda. Reflecting these main ideas, our data collection took place in two domains: photography and time-lapse videography. To fully understand our users, however, we had to take an ethnographic delve into active social spaces in attempt to illuminate the motivation structures whose movement defines a social space. In other words, we wanted to discover what made a space "social" by looking at how architecture influences the movement of people. In order to get a preliminary overview of the location and characteristics of sitting spaces available on campus, our group split into teams and documented the various sitting areas, populated and vacant, around the campus. Our first step was to take a photographic survey of successful social spaces on campus. Each picture was labeled, then organized into a 10x11 matrix in which activity served as one axis and architectural elements of the space served as the other axis. Activities included: socializing, sitting, standing, walking, event, eating, resting, phone, unused, and studying. 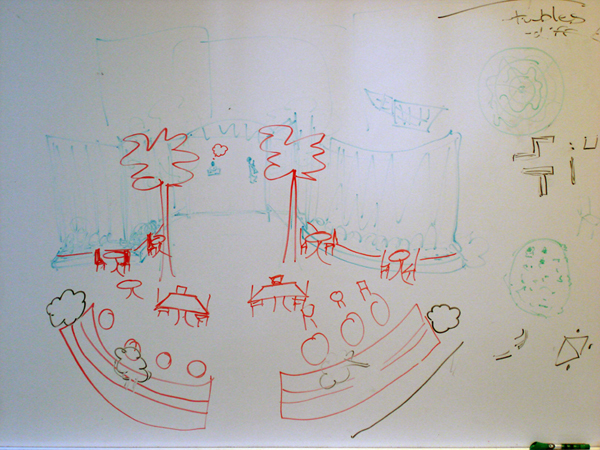 Physical features included: table, coffee, food, stadium, cement, stairs, water, sun, shade, path, grass, and bench. Gossamr was developed as a convenient tool to find patterns in the data. After performing the interviews, we went over all the data for each interview, creating models that made, among other things, the cultural or physical factors explicit. Pictured below are the consolidated flow and cultural models. 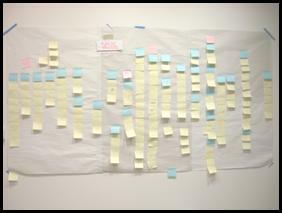 Then we created a large, bottom-up affinity diagram, where the data was organized based on how it was related to other data, and not on how it was collected. In the visioning process, the previously collected and abstracted data fed a series of redesign ideas for the patio. The goal of this was to branch out and get as many ideas into consideration, without worry of feasibility, so that the problems or ideas were fully grappled with. Then, a revising process narrowed the vision down to something more practical. Once we arrived at a semi-reasonable vision, we mapped out the function of the space in order to further shape the final design idea. This involved specifying the different functions that the space could take on, and how those functions were related. How is the space used? We started out with the idea of observing how people use the space. We were able to determine specific points of access but the more interesting problem of how people move was difficult to quantify or even to get a sense of it. Participant observation allows for a good feel for the space but there is too much to look at. With time-lapse video we were able to capture video of people moving through the space and achieve a better sense of how it is being used. This allows for a good overview of the space but introduces distortions based on the perspective. The Career Services Center (CSC) is centrally located and is a high-traffic area. The space is currently under-utilized, functioning mainly as a pathway. 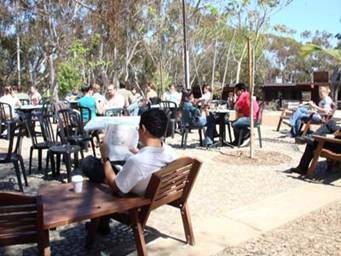 Our goal is to make it a destination in its own right and a social one at that. What do we do with the traffic? Traffic ensures that many people pass by a place. This is a good thing, especially when one considers that people-watching is a common activity; but it can be distracting and can destroy the ambiance. We chose to limit the flow of that traffic by redirecting that flow around the patio with benches and by complicating the flow of that traffic somewhat through the patio by positioning trees and signs subtly on that traffic flow path. This allows the continued free flow of people through the patio but places a limit on the number which could use the space for this purpose. In addition, by changing how people can maneuver through space we have forced their recruitment of additional cognitive resources. While people are moving past the CSC, they will be more aware of that passage and more likely to attend to the signs announcing the services the CSC provides. Redefining the traffic flow in this manner thus serves the functional purpose of increasing student use of the CSC.